It was almost unanimous. Almost. According to the overwhelming majority of you, staging is very important in selling a home. So with that in mind, I’m starting to put things together for the bedroom. I brought the mattress set and bed frame in and set them up between the closets, and then brought the headboard back in. Ugh. That headboard. It was so pretty when I made it. But after four years of use, leaning against it every night and every morning while working on my laptop, very often with wet hair after a shower, the headboard was looking pretty dingy. (Only vinyl, leather, or wood headboards for us from now on.) So I decided to clean the whole thing with a baking soda/water/vinegar solution. I scrubbed and scrubbed the whole thing, but the fabric turned out looking even worse — very streaky and dull with discolored areas. It definitely wasn’t what I was hoping for after a good cleaning. So I moved on to Plan B — new fabric. I wasn’t about to take the time and effort to remove all of those nailheads (those are individual nail heads that I nailed in one by one– I don’t like and don’t use those nail head strips), so instead I just reupholstered right over this fabric. …and then I got an additional 10% off because the whole roll of fabric had defects on the back. Fortunately they don’t show through to the front. Then I used a package of hi-loft batting (crib size, I think it was) with a 60% off coupon from JoAnn Fabrics. So for just under $25, and about 45 minutes of wrapping and stapling, my headboard has a brand new look. 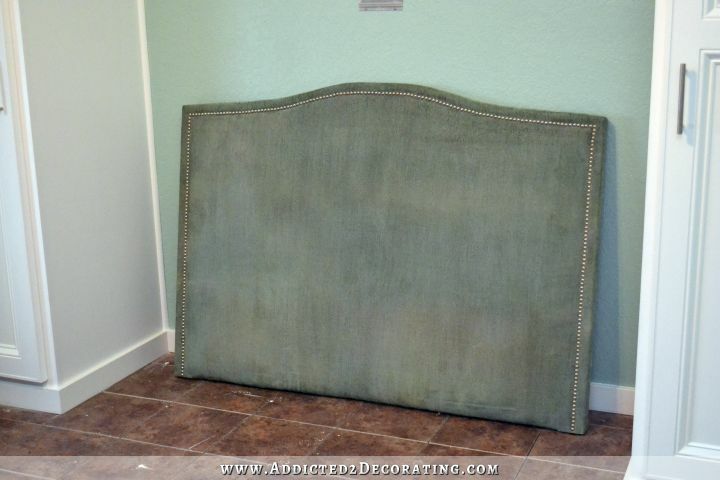 Upholstered headboards are so incredibly easy to make. 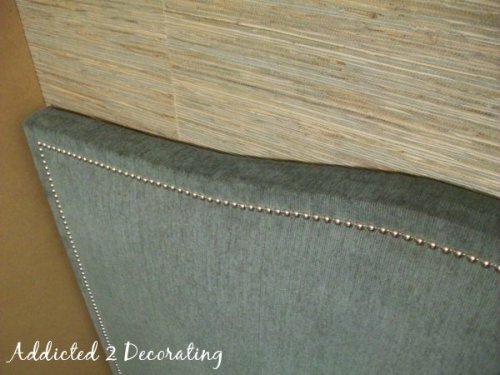 I didn’t take pictures of the process because there are approximately 1,452,746 tutorials online on how to make a wrap-and-staple upholstered headboard. If you need instructions, this is a good tutorial from Better Homes & Gardens. But the very abbreviated version is that I smoothed the batting out on the front of the headboard, wrapped the edges around to the back of the headboard, and stapled it on. Then I did the very same thing with the fabric. I used my staple gun that came with my air compressor to do the stapling, but you can use an electric staple gun, or even a manual staple gun to do a project like this. I love the color and pattern that it added to the room. I don’t want to go overboard with crazy patterns and colors, but this fun fabric seemed just right for my colorful condo. I always hang my upholstered headboards on the wall when I can, and I use Ook Hangman French cleats to hang them. I’ll keep the bedding a bit more neutral, with maybe a colorful throw at the end of the bed. 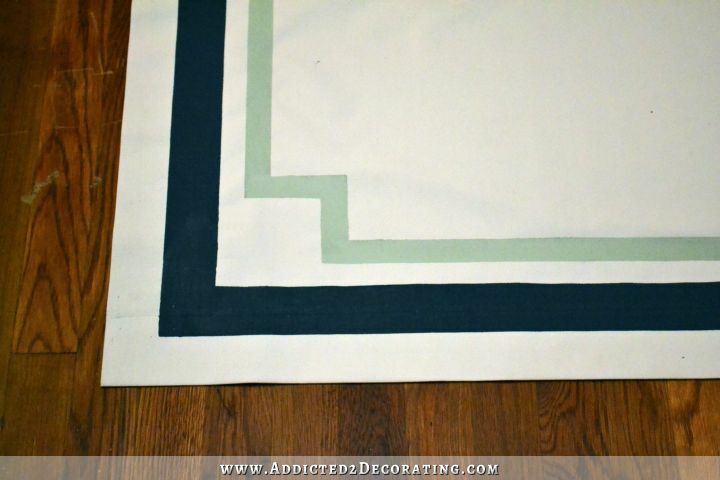 And last night, I also started making some very easy and very inexpensive curtain panels for this room. I’ll share those as soon as I get them finished and hung. Previous Post To Stage Or Not To Stage A Home For Sale? The headboard turned out great, but I think I would have painted it instead of spending money for fabric and batting. I guess I keep more craft items on hand. For next time, you can water down the paint instead of using fabric medium (have you ever tried to wash paint out of your clothes? it’s not coming out.) And you can use Rub n Buff on the nail heads. C, my only concern about your bed and wall is, because I am an inveterate reader who reads herself sleepy; will you install little lamps on the sides of the closets, or perhaps on the wall behind the bed? I also like having bedside lamps because I hate to have to turn out the lights by getting up and going to the wall switch. Did you have lamps when you lived there? I am so excited to see you working on the condo. 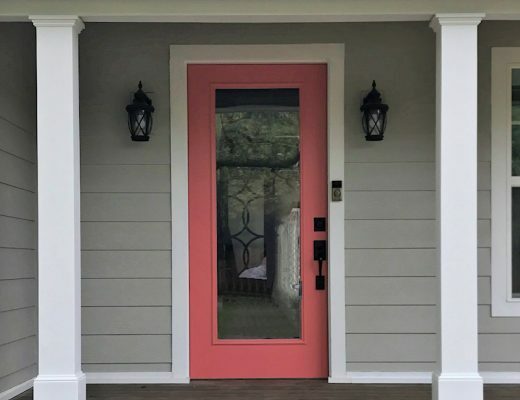 These quick fixes are eye candy for us. Lol I predict you will sell quickly and have money for your forever home as well as a peaceful mind knowing you don’t have to worry over the condo any longer. Yay for immediate gratification. Plus decorating is just fun. Wish I had 1/2 of your building know how. Oh and more time. The condo will look great and you will be proud to show it! it’s great to see the room with a bed in it – and the space you left for bedside tables or boards 🙂 I’m looking forward to see how you went about the curtains, they look lovely! since there doesn’t appear to be a lot of space for side table’s, are you going to attach like a shelf to the side of the cupboard ? beautiful work !! Yep, I’ll be adding a couple of shelves. Great job! Be careful when adding shelving as most mattress sets can vary in height by several inches. What may fit your staged bed may not work for your new owners. Can’t wait to see the end result! Great job! and great fabric! I think that headboard is perfect between the built-in and the neutral blue color. Those colors are “happy” colors. I think it adds much to the room. Someone is going to be lucky to get this condo. The rooms look so much bigger than your neighbor’s. It’s amazing! I love the curtain plan! 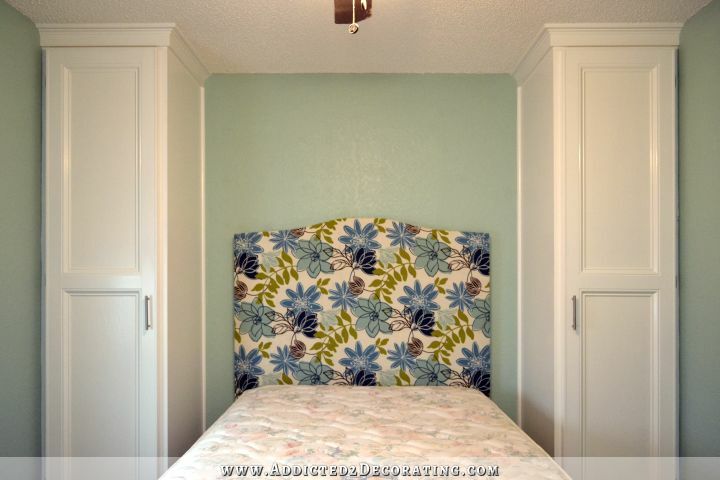 I am glad you came up with a simple headboard solution. Though the fabric is a little juvenile for my taste I could see a college student really loving the room you put together. Love it! I too have a fabric headboard that I switch the fabric on regularly. I love the options it gives me. I like the suggestion someone had of offering the condo furnished. I have a bit of claustrophobia and the closets are a bit close to the bed for me, but the look is great. Good job! love it! I agree…someone will come in and snap that up for their college girl. And furnished? I think that is a definite possibility. I totally would have for my girl if something like that had been available when/where she was in school. How far from the campus are you? It’s about four blocks from campus. Yep, I plan to add some shelves. I also have wall sconces that were installed on the old closets, so I plan to put those up as well. Silly me…..of course your way ahead of me on this! 🙂 Love what you do! Looks pretty. If I were buying it I’d add sconces on the size of the cabinets, shelves w/corbels for night stands and be good to go. Loving where this is going. Nice headboard save! It’s fun for your readers (or me at least!) to see the quick instant gratification projects too! how exactly did you hang the headboard. I love the idea of offering it furnished or not. It does seem a bit more girlie, are you worried about that? I love this headboard and think that simple navy blue bedspread would be perfect with it. It would accent the wall color and the navy blue in the headboard. Simple but effective. I’m glad you are finishing up the condo projects as I’ve always loved your condo and the things you’ve completed. You are very practical but eclectic. Makes for a wonderful mix. Very pretty fabric. What are you going to do about bedside tables/lighting? Anything? Something to consider, if I saw it just the way it is I would plug in a floor lamp (I have one that would fit perfectly) and wouldn’t want shelves to interfere with making the bed. Simpler the better for me. I understand that you have sconces to hang but simpler better. It already looks so nice and clean and pretty! I, too, loved your old fabric headboard, especially with the grasscloth wall covering, This new fabric is so fun, though. It looks grey with the wall color and will definitely leave a good impression in the buyer’s minds. 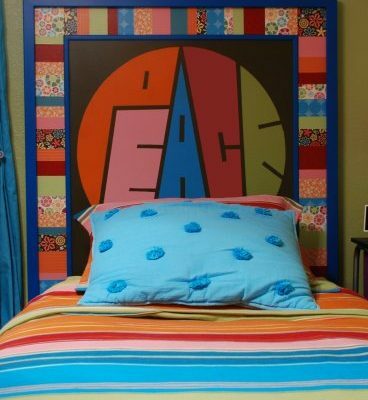 I like the builts ins and the headboard, but i’m a bit worried the fabric may be too colorful and cause a distraction to the buyers. I’ve always heard they need to imagine their taste in the decoration, that’s why agents suggest very neutral white or beige tones. You’re so very talented with colors and making items work, it may be that my monitor isn’t doing justice to the true colors, but it looks really green to me. It’s fabulous and my college aged daughter would definitely approve! Love that fabric! Good choice! It will bring in the college crowd for sure. And, even though I haven’t been in college for a very long time, I would gravitate to it too. Young and fresh, it says. Excuse me, I need to go to the fabric store! Kristi, I grew up in the 50, 60, and 70’s. That is what your fabric looks like, big, bold and loud! 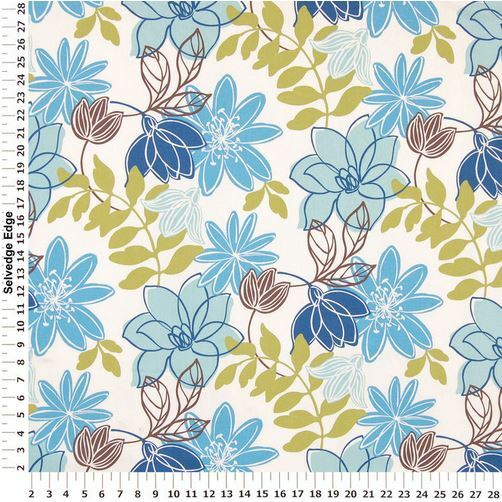 I had a bedspread in just those colors and the big flowers and I really loved that old thing! A lot of happy memories when I opened the mail today! Keep up the good work! Had I voted I would have said staging is a must for selling. Just so I could see your fabulous staging ideas!! Don’t they sell Folex carpet and upholstery cleaner/stain remover in your neck of the woods? Please let us know when you’re ready to sell. My cousin’s daughter goes to Baylor and they might be interested in getting this for her. I m a big fan of the work you do, however college tweens have no respect for “other people’s ” hard work and effort. There are some people who don’t even appreciate their own homes!. Looking at some of those who want to sell on HGTV. Disgusting and dirty. I hope the person who will live in this condo is nice, clean and appreciative. Love it. It was the perfect fabric. 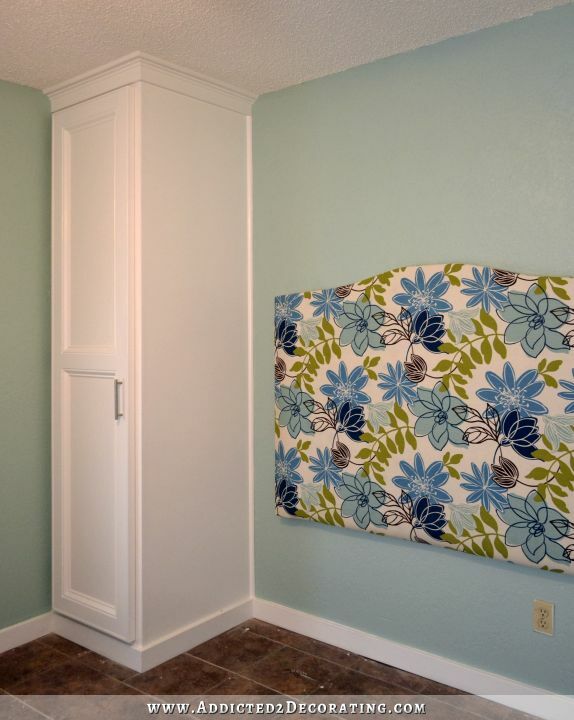 Model homes use bold colors in their window treatments/bedding. It’s likely some buyers will want the furnishings too.